March 2014 - Website of kennetaccordionorchestra! The end of 2013 saw the orchestra complete a busy festive season, performing at a number of concerts, competitions, shows and accordion club events throughout November and December. Following weeks of intense rehearsal we competed at the National Accordion Organisation regional festival in Wimborne, Dorset, in November, with pieces including Pirates of the Caribbean, West Side Story, Great Escape and Florentiner March. As always this was an enjoyable day with a chance for our members to meet and listen to accordionists from throughout the region. Later in November we accepted a kind invitation to perform to a large number of fellow accordionists from the South Hampshire Accordion Club in Southampton. In between the orchestra's performances we joined a 'play along' with around 50 accordion players who attended the day. If there are any budding accordionists who would like join the South Hampshire Club, please contact us via the website and we will put you in touch with their leader, Adrienne Griffiths. In December we hosted our first 'Annual Christmas Concert' at the Croft Hall in Hungerford. 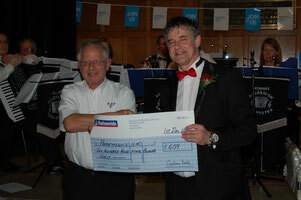 We were delighted to perform in aid of the Newbury and District Branch of the Parkinson's UK Charity. Over 100 people in the audience contributed to a great atmosphere and their generosity helped raise over £1,300 for the charity. Thank you to all those involved in making the evening such a success. Our regular slot supporting the Kennet Singers saw two fun filled evenings of music, singing and acting, with both nights selling out. Janet and her team as usual put on a fantastic show and we look forward to supporting them again this year. The season drew to a close with a relaxing concert at Avebury Social Club on a very wet and windy December evening, with those who had braved the inclement weather having a sing along or two throughout the evening. Nigel was busy over the Christmas break arranging new pieces for the orchestra to start rehearsing in January and we have been working hard on these over the last few weeks. These are now ready to debut at our upcoming concerts, so in addition to the old favourites, you can look forward to hearing some new pieces in 2014. We have already played our first concert of the year, performing a Valentines Evening concert at the splendid Holy Trinity Church in Trowbridge. Looking forward we are currently working on pieces to play at the New Milton musical festival, a concert alongside the Cowbridge Male Voice Choir and Pewsey Bells at Bouverie Hall and will end March performing pieces for PHAB in Chippenham on the 31st. For details of all of our upcoming events please see our Diary page.